The radiology department at newly opened Our Lady of Lourdes Regional Medical Center in Lafayette, Louisiana, uses only direct digital radiography (DR). Going digital has worked out extremely well for everyone—patients, radiologic technologists, and radiologists, Ortego says. The digital system has increased productivity, has improved image quality, and is safer for patients because the required radiation dose is lower, he says. With DR, the image data are transferred directly from a detector to a review monitor without the need for a reader. The technology debuted in the mid-1980s, about the same time as cassette-based CR technology, but until recently, DR’s much higher cost prevented more widespread adoption. As the cost of DR has come down and its capabilities continue to increase, more facilities of all sizes are utilizing it, especially in emergency departments (EDs) where quick turnaround of imaging exams can be crucial. Over the last two decades, most facilities in the United States have transitioned to CR from film because CR eliminates wet film chemistry and silver recovery, reduces retakes, and reduces the problem of lost or damaged films. The CR reader scans the exposed phosphor plate and can send digital images to a printer or directly to the facility’s PACS. But like film, CR still requires the technologist to leave the patient’s bedside and walk to a processing area. DR eliminates that step and thus saves time. 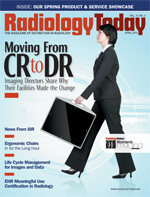 Like Ortego, Marc Katz, BS, RT, corporate director of radiology for Continuum Health Partners in New York City, wanted to upgrade to an all-digital environment when the organization renovated and expanded the EDs at Beth Israel Medical Center and Roosevelt Hospital about three years ago. At each site, two rooms are outfitted with GE DR systems and a portable DR system that’s designed for ED and bedside use. Within the last year, at its Phillips Ambulatory Care Center at Beth Israel in Lower Manhattan, Continuum converted two CR rooms used for orthopedic and musculoskeletal imaging to Fuji DR.
Katz says the timing was right for the upgrades. “The upgrades were related to patient throughput as well as replacement of end-of-life equipment. In terms of the emergency department at Beth Israel and Roosevelt, it was a result of a complete renovation and expansion. You had to relocate equipment, and it didn’t make sense to relocate equipment that was at the end of life on the X-ray side,” he explains. The health system chose to upgrade these departments because the speed at which exams are performed and results are made available can be critical, Katz says. Continuum’s DR rooms have increased productivity by about 15% to 20%, Katz says. Productivity increases can help offset the additional cost of the DR systems. However, he says, reimbursements remain the same whether the studies are done using film, CR, or DR, so it takes a while to see a return on the investment in DR. The radiologic technologists welcome the conversion to DR when it happens and like working in a DR environment because they no longer need to handle the plates, according to Katz. The hospital has five portable machines, two of which were converted to DR. The two DR portables are used for about 90% of the imaging exams, Sisco says. “With the DR portables, two are doing what four or five were doing before. The technologists would rather use the portable DR machine even if it means having to go and get it and take it to the patient’s bedside,” he says. “It’s still faster than shooting with CR and walking the plates to the processor.” The new DR systems have increased efficiency without the need to add new X-ray systems, he says. Dose reduction is another advantage of DR, Sisco says. DR has allowed the health system to dramatically improve image quality while cutting patient dose in half compared with its CR-based room and portable imaging systems, he says. In a study published in May 2011 in Clinical Radiology, Dutch researchers found that bedside DR chest radiography could produce high-quality images with 50% less radiation than CR. The researchers obtained images for 114 patients with CR, DR, or DR with a 50% dose reduction and had readers score them for overall image quality and disease. The readers found images taken with DR or DR with the dose reduction outperformed those done with CR. Sisco also finds maintenance to be an advantage with his Carestream DR systems because the detectors are interchangeable. “If you need to for any reason, you can take one of the detectors out of the digital radiography system in the X-ray room and reassign it to a portable to keep the operation going,” he says. “Drawbacks to converting to DR? I can’t think of any,” Katz says, noting that he hopes to expand its use at Continuum’s facilities as its CR equipment reaches the end of its life. Widmann also expects to see the demand for DR continue to grow rapidly as its capabilities expand and prices of the technology continue to fall. “It’s making economic and clinical sense these days,” he says. — Beth W. Orenstein of Northampton, Pennsylvania, is a freelance medical writer and a frequent contributor to Radiology Today.